William Irwin’s The Free Market Existentialist: Capitalism without Consumerism (2015) is a noble endeavor that attempts to reconcile his love of free enterprise with his flair for the existential. Existentialism is a philosophy that recognizes the despair and absurdity of human existence and offers a way of coping with it. For existentialists, individuals must choose to be their authentic selves, which they discover and create through concrete decisions and experiences. A free market economy is one that has limited government involvement and promotes competition between privately held businesses. Irwin correctly draws parallels between existentialism and the ideals of liberty that underpin the free market—an uncommon and intriguing insight. Both concepts emphasize the individual over the collective, the importance of agency in decision making, and the significance of taking personal responsibility for one’s own free choices. In marrying two notions that people rarely consider together, Irwin offers to existentialists an opportunity to realize that they are more open to free exchange than they might have known, and shows free-marketeers that their views on political economy are compatible with existentialism. Both of those books would have been interesting. Neither is what Irwin achieved. Instead, Irwin took the existentialism of Jean Paul Sartre (in his early years) and rather indelicately tried to fit it into his small-government libertarianism. In choosing this method, the project was doomed from the start. While broadly speaking, existentialism describes the impulse for an individual to want their lives to have meaning, by limiting himself to Sartre’s account of existentialism instead of also drawing from other existentialists, Irwin unnecessarily hinders his ability to show that existentialism is compatible with the free market. Firstly, by focusing on Sartre, Irwin does not do justice to existentialism. Sartre represents a narrow group of existentialists who respond to life’s meaninglessness without a concept of God. There are numerous existentialists — including the very first existentialists — who think that the only way to endure life’s absurdity is with God. French mathematician and inventor in the 17th century, Blaise Pascal, was a forerunner of the existentialists. For Pascal, the best option to overcome the despair of human existence was encapsulated in what is commonly known as Pascal’s Wager. Pascal said that when it comes to the question of whether or not God exists, people gambled lives in deciding which was true. Even though he himself was a brilliant scientist, Pascal was skeptical of the enlightenment project’s elevation of science and reason over faith. In a beautiful aphorism in his Pensées, Pascal writes, “The heart has reasons that reason cannot understand.” He knew that the most important things in life, such as the meaning of human existence or the existence of God, could not be explained by a scientific equation, but must be believed or experienced. For Pascal, the stakes were too high to risk being wrong, and he wagered to believe. 19th century Danish philosopher Søren Kierkegaard, the first modern existentialist, also understood that the use of reason and the intellect was of limited use in gaining knowledge of the things that truly mattered. Kierkegaard, like Sartre, knew life was defined by anxiety and despair. But unlike Sartre, Kierkegaard’s remedy was faith in God. Kierkegaard wrote that life is merely a “sickness unto death” and it was only through faith in Jesus Christ, the physician of the soul, that we could attain hope and healing. Relatedly, by limiting himself to an existentialist like Sartre who did not believe in God, Irwin makes it far more difficult for himself to make an existentialist case for natural rights, let alone the property rights that are essential for free markets to thrive. Sartre, following in the footsteps of Friedrich Nietzsche, took seriously that the death of God meant that no objective values existed. By “death of God,” these men meant that the Enlightenment project’s elevation of reason over the “monkish superstition” of religion is responsible for the demise of the sacred and the central role Christian morality played. Because society has moved beyond good and evil — which does not diminish evil, but only makes it relative — they said that it is up to each individual to define good and evil for themselves. However, the absence of any universals — whether they be truth or morality — is problematic for a free market libertarian. If people create truths for themselves — such as the concept of human rights — then that means that some people will not enjoy them. Secondly, if rights are not universal, but simply the product of people’s self-creation, what obligation does a government entity have to respect them in all members of a citizenry, or for individual people to respect one another? A concept of God is necessary for a concept of universal human rights. If rights are not universal, then there is no need for government to respect them universally. Consent alone cannot suffice. Irwin also offers a chance to consider what moral and metaphysical foundations will actually allow us to defend human rights—central to a classically liberal vision of political economy. 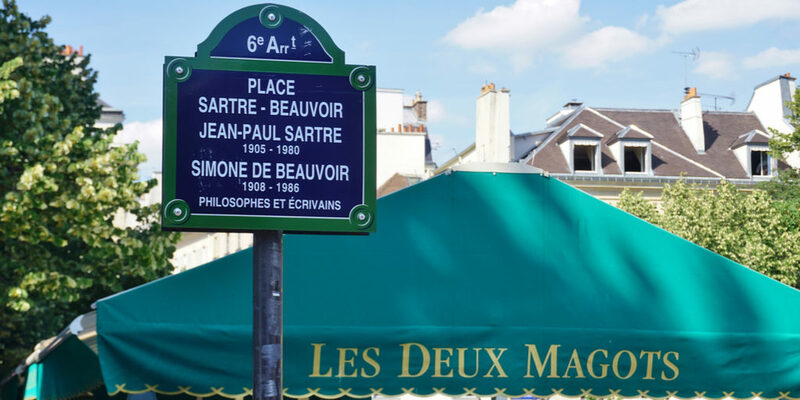 Sartre categorically denies the possibility of God’s existence. Some dispute that a notion of God is necessary to have human rights, but there no denying the views of early rights theorists—from Locke to Jefferson—were grounded in God, or that human dignity, the philosophical foundation of human rights, is explicitly grounded in the Judeo-Christian tradition. All Irwin needed to do was include existentialists that did not make such categorical and unprovable claims about God’s existence — like Pascal and Kierkegaard who stated that, because God’s existence cannot be proved, choosing to have faith in his existence was the only way to lend life meaning — and he would allow himself room to make the case for rights, and therefore the free market, within the framework of his existentialism. In a way, Irwin’s very project is an exercise in existentialism: part of the existential drive for authenticity involves the pursuit of inner cohesion, which perhaps explains Irwin’s desire to reconcile the free market and existential philosophy — two things he really, really likes — in the first place. The drive for veracity and internal consistency is a noble one. But Irwin’s perplexing commitment to Sartre hinders his success. The only result is an incomplete account of existentialism and a weakened case for how existentialism is compatible with free markets. However, Irwin’s shortcomings in this endeavor are also existential in nature. In his Concluding Unscientific Postscript, Søren Kierkegaard directly confronts G.W.F. Hegel, who was emblematic of the rationalist and systematic school of philosophy that Kierkegaard thought woefully insufficient to help us grapple with life. Kierkegaard thought it was impossibly arrogant to pretend that in any endeavor of ideas, the philosopher stands outside the system as an objective observer, such as what Irwin attempts to do with this project. Irwin is, like anyone, captive to their own biases. It is impossible to approach any enterprise without our subjective perspectives, and therefore impossible to understand anything in an entirely objective way. It is therefore necessary to have humility in our epistemology, understanding that there is much in life that does not and will never make sense — that there will always mysteries the cannot be solved, and ideas that cannot be reconciled. For Kierkegaard, life is an amalgamation of incomprehensible paradoxes. Yet while we need not resign ourselves to Kierkegaard’s irrationalism to cope with life’s mysteries, Irwin’s shortcomings remind us of the humility necessary to cope with life in an absurd world.